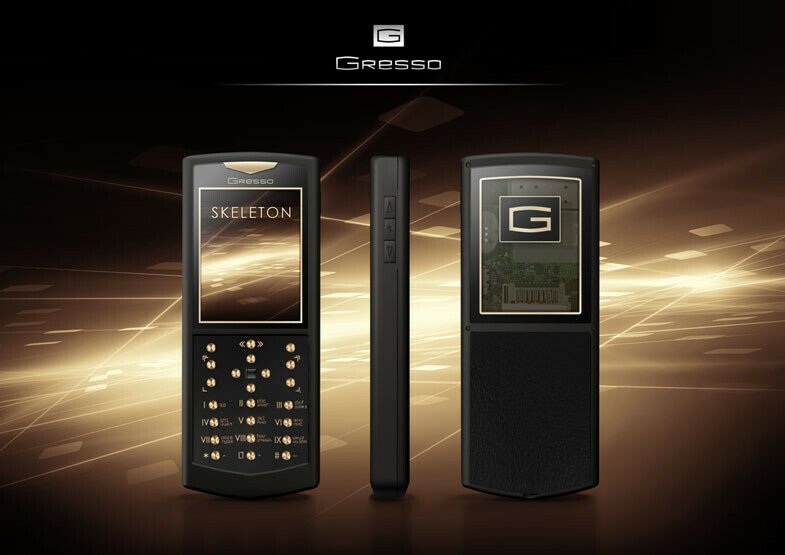 The luxury cell phone manufacturer Gresso has renovated its Skeleton line, introduced in December, with a new Skeleton Gold collection. The new device fully resembles the previous one, but what is new about it is that all of its 23 keys are now made of 18K gold, along with the golden triangle right above the display. The screen of the phone itself is framed by hand-polished 42K sapphire glass. Gresso seems to have made a good use of the sapphire crystal, as it has used it in order to make a part of the back side, through which the user will be able to examine the inner mechanism of the device – a feature that has been inspired by Swiss skeleton watches. That element also houses the manufacturer logo, covered with 10 micron gold. The luxurious materials used in the craftsmanship of the Skeleton Gold do not end here. The body is made of special titanium alloy, covered with scratch-proof ceramic. Other interesting details, related to the phone’s design, include roman numbers, as well as a magnetic lock mechanism for the battery cover. It is made of stainless steel and decorated with genuine leather. If you wish to have the Skeleton Gold more than anything else in the world, we have a good and a bad news for you. The good news is that it is $600 cheaper than the previous Skeleton phone! However, the bad news is that it remains just as expensive at $4400. Moreover, if you do wish to spend that much money, you should hurry up and contact the manufacturer because there will only be 50 units of it (which is not that limited, having in mind that the original Skeleton was manufactured in just 15). The Gresso Skeleton Gold, however, is not just an ultra-expensive toy. It might as well serve you as a business assistant, since it runs the Windows Mobile 6 Standard operating system, which delivers all the necessary tools for organizing your money-making deeds. Why would anyone want this phone? What happens ones it becomes obsolete?